Four Oaks Bakery is a made to order, custom cake boutique owned and operated solely by Emily and Ryan Jobe in Greensburg, Pennsylvania. 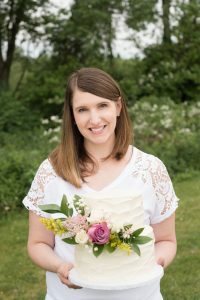 Emily serves as the creative force behind the tempting flavors and elegantly modern designs for wedding cakes, while Ryan handles the business end of the bakery. Our three sweet and crazy little boys delight in their roles as the official taste testers. I (Emily) have always been drawn to sweet treats. Baking and creating in the kitchen is relaxing for me and the way that I show others that I care. I love how cake decorating combines my perfectionist tendencies with an intense desire to create beautiful (and tasty!) things. The bakery started organically, as I baked and decorated cakes and cupcakes to celebrate special occasions with our family and friends. Over time, more and more people requested cakes for their own celebrations. As demand grew, we realized that we had a business on our hands and eventually decided to go all in. It's an honor to help others celebrate the special moments in their lives with cakes that beautifully complement their events. Remaining true to our roots in family celebrations, at Four Oaks Bakery we understand the importance of your special event. We know that you have a vision for your day and that you want all of the details in place and "just right" because that is how we feel, too. Trust me when I say that I give the same amount of time, love, and attention to what I create for you as I do for my own family. When you work with Four Oaks Bakery, you will receive personalized service to guide you through the creation of the custom cake that will be a centerpiece for your celebration and have your guests "ooh-ing" and "ahh-ing" at the experience. From the initial contact all the way through to designing, baking, decorating, and delivering, we are with you every step of the way. We look forward to working with you and are honored that you chose Four Oaks Bakery to celebrate your special day.